Linda Chapman was born in 1969. Before before becoming a full-time writer in 1999, she had many jobs including being a teacher, stage manager, book-seller, university researcher and dog trainer. 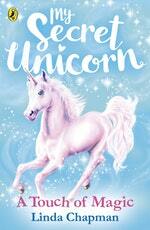 She has written over seventy books for children including the My Secret Unicorn, Stardust and Not Quite a Mermaid series. Linda lives in a village in Leicestershire with her family and two Bernese Mountain dogs. When she is not writing she spends her time looking afer her two young daughters, reading, putting on plays and horse riding. Linda Chapman lives in Leicestershire with her family and two Bernese mountain dogs. When she is not writing she spends her time looking after her two young daughters, horse riding and teaching drama. Be the first to find out about Linda Chapman.